Over the past fifty years, increasing numbers of American Catholics have abandoned the economic positions associated with Franklin Roosevelt's New Deal and chosen to embrace the principles of economic freedom and limited government: ideals upheld by Ronald Reagan and the Tea Party movement but also deeply rooted in the American Founding. This shift, alongside America's growing polarization around economic questions, has generated fierce debates among Catholic Americans in recent years. Can a believing Catholic support free markets? Does the Catholic social justice commitment translate directly into big government? 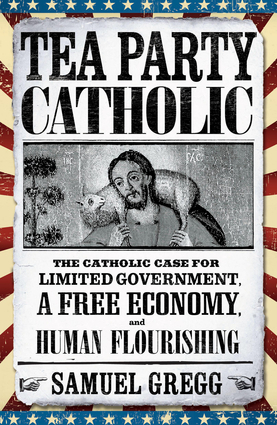 Do limited government Catholic Americans have something unique to contribute to the Church's thinking about the economic challenges confronting all Catholics around the globe?In Tea Party Catholic, Samuel Gregg draws upon Catholic teaching, natural law theory, and the thought of the only Catholic Signer of America's Declaration of Independence, Charles Carroll of Carrollton—the first "Tea Party Catholic"—to develop a Catholic case for the values and institutions associated with the free economy, limited government, and America's experiment in ordered liberty. Beginning with the nature of freedom and human flourishing, Gregg underscores the moral and economic benefits of business and markets as well as the welfare state's problems. Gregg then addresses several related issues that divide Catholics in America. These include the demands of social justice, the role of unions, immigration, poverty, and the relationship between secularism and big government.Above all, Gregg underlines how economic freedom's corrosion in America is undermining the United States' robust commitment to religious liberty—a principle integral not only to the American Founding and the life of Charles Carroll but also the teaching of the Second Vatican Council. As a creative minority, Gregg argues, limited government Catholics can help transform the wider movement to reground the United States upon the best insights of the American Experiment—and thereby save that Experiment itself. Samuel Gregg is research director at the Acton Institute. He is the author of many books, including his prize-winning The Commercial Society (2007), The Modern Papacy (2009), and Becoming Europe (2013). He lectures regularly in America and Europe on topics encompassing political economy, Catholicism, and morality and the economy. His writing has appeared in academic journals and magazines including National Review, The American Spectator, Foreign Affairs, and Crisis Magazine, as well as newspapers such as the Wall Street Journal, Investors Business Daily, and the New York Post.